Fernando Lara lectures at Parsons School of Design, discussing participatory budgeting strategies in Belo Horizonte, and recent projects in the Brazilian favelas. 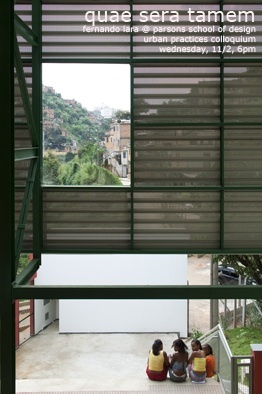 “Vila Viva Favela Redesign, Belo Horizonte, Brazil.” Claudius Pereira, chief executive of the Agency for Housing and Urbanization for Belo Horizonte, Brazil, and Dr. Fernando Lara, architect and professor at the University of Texas, Austin, discuss the redesign of the Vila Viva Favela, winner of a Metropolis Award. TIME: Wednesday, November 02, 2011 6:00 p.m. – 8:00 p.m.